Dreams La Romana Resort and Spa is a beachfront, all-inclusive resort, offering families, friends and couples a lively, fun-filled vacation on a gorgeous stretch of white-sand beach in beautiful La Romana. Escape to Unlimited-Luxury®, where guests will be treated to spacious rooms and suites with fully stocked mini-bars, private terraces and fabulous views. Non-motorized water sports, clubs and activities for kids of all ages plus spectacular dining with multiple specialty themed restaurants and bars guarantee plenty to do in this exciting, high-energy resort. The beachfront all-inclusive Dreams La Romana Resort & Spa offers families, friends and couples a lively, fun-filled vacation on a gorgeous stretch of white-sand beach. Escape to Unlimited-Luxury® where everything is included. 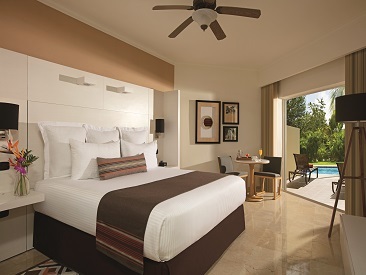 Guests will be treated to spacious rooms and suites with fully stocked mini-bars, private terraces and fabulous views. Non-motorized water sports, clubs and activities for kids of all ages, and spectacular dining with multiple specialty themed restaurants and bars serving domestic and international beverages along with an endless list of things to do for the whole family guarantee plenty to do day and night in this exciting, high-energy resort. 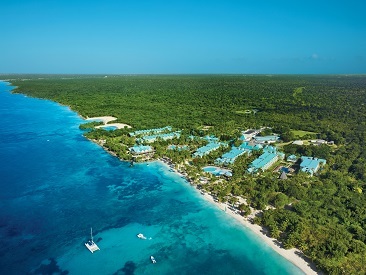 Dreams La Romana is on the southeast coast of the Dominican Republic, in the La Romana area of "Bayahibe", 20 minutes from the La Romana International Airport and 35 minutes from the Punta Cana International Airport. La Romana is known throughout the world for the incredible golf at Casa de Campo (its famous "Teeth of the Dog" golf course is just 30 minutes away). The Preferred Club is an exclusive area offering exceptional services, a private lounge and Preferred Club suites offering impressive garden and ocean views all in premium locations. 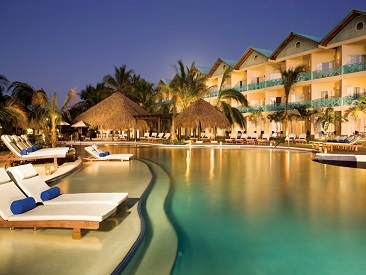 As part of Unlimited-Luxury® guests of Dreams La Romana have access to Dreams Palm Beach Punta Cana, Dreams Dominicus La Romana, Dreams Punta Cana Resort & Spa and Now Larimar Punta Cana. The Sip, Savor & See Dining Experience includes complimentary dinner, drinks and entertainment at a restaurant or bar at a resort of their choice. Guests can utilize the facilities at the resort they are visiting from 6pm to 1am. The experience is only good for dinner via reservations made through the resort concierge. Guests are responsible for the cost of transportation to and from the resort for a maximum of four people per seating. Bring along a copy of your Marriage Certificate and receive champagne and fresh fruits upon arrival, breakfast in bed, a romantic dinner and 15% off spa treatment.